"Sampath Speaking" - the thoughts of an Insurer from Thiruvallikkeni: India beats Pakistan at London ~ fans celebrate !!! India beats Pakistan at London ~ fans celebrate !!! An India-Pakistan match is not just a game. The intensity of the match goes well beyond the realm of sport. It’s a psychological battle between two teams almost remote-controlled by their millions of fans, or at least they seem to believe they do. Much before the coin was tossed, there has been so much on the match, its possibilities, more so on how many could be viewing – how many millions or would it touch a billion ? the grandiose predictions about viewing figures for India's meeting with Pakistan in the final of the 2017 Champions Trophy. The whole Nation was glued to telesets and were getting increasingly despondent. The venue was Kennington Oval – the place where it had begun. The place where the first-ever Test on English soil was played in Sept. 1880, resulting in an England win over Australia by five wickets, with WG Grace scoring a hundred on debut. Traditionally the England series ends at Oval. It is also the historic venue where the legend of the Ashes was born a couple of years after the inaugural Test, in August 1882. England, chasing only 85 to win, slumped from 51 for 2 to 78 all out. The next morning The Sporting Times published its famous mock obituary and the legend was born. Perhaps there was reason for Indian fans to move away a little distance away and watch the India Pakistan match played at Lee Valley Hockey and Tennis Centre in the north of Queen Elizabeth Olympic Park. Lee Valley Hockey and Tennis Centre is located on a part of Queen Elizabeth Olympic Park known as Eton Manor which during the London 2012 Olympic and Paralympic Games staged the Paralympic Wheelchair Tennis Competition. The primary hockey pitch has a capacity of 3,000 which can be increased to 15,000 for major events. For the uninformed – in Hockey a team consists of a maximum of sixteen persons composed of a maximum of eleven players on the field and up to five substitutes. This may be amended by Regulation to a maximum of eighteen players. The field of play is rectangular, 91.40 metres long and 55.00 metres wide. Lines known as 23 metres lines are marked across the field 22.90 metres from each back-line. A match consists of two periods of 35 minutes and a halftime interval of 5 minutes. A goal is scored when the ball is played within the circle by an attacker and does not travel outside the circle before passing completely over the goal-line and under the crossbar. The ball may be played by a defender or touch their body before or after being played in the circle by an attacker. The 2016–17 Men's FIH Hockey World League Semifinals is just over. The round is to serve as a qualifier for the 2018 Men's Hockey World Cup as the 10/11 highest placed teams apart from the host nation and the five continental champions qualify. 11 teams ranked between 1st and 11th in the FIH World Rankings current at the time of seeking entries for the competition qualified automatically, in addition to 8 teams qualified from Round 2 and one nation that did not meet ranking criteria and was exempt from Round 2 to host a Semifinal. 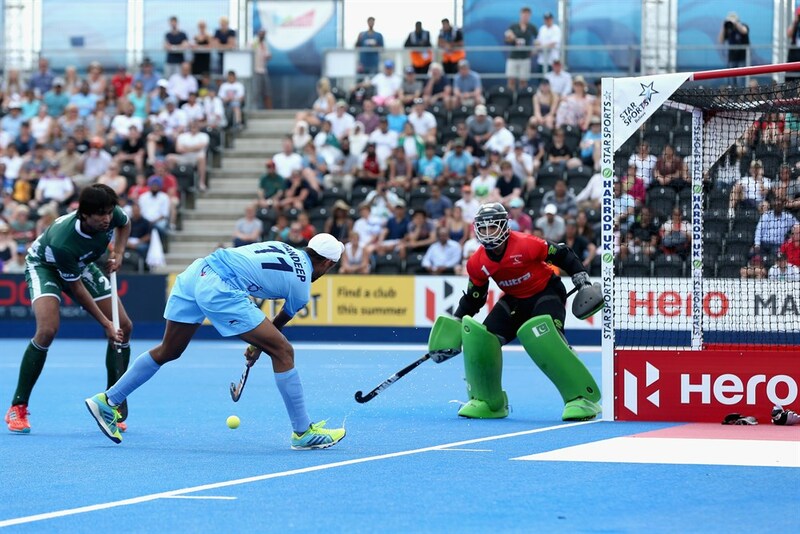 In Pool B, India played Netherlands, Canada, Scotland and arch-rivals Pakistan. The happy news is : India beat Pakistan 7-1 with Harmanpreet Singh, Akashdeep Singh and Akashdeep Singh scoring two goals each while Pradeep Mor contributed with one goal. For Pakistan, Mohammad Umar Bhutta scored the lone goal. India secured an all-win record as they registered a comfortable 7-1 win over arch-rivals Pakistan in their group game of the Hockey World League semi-final being played in London. With the win, India cemented their place at the top of their group. 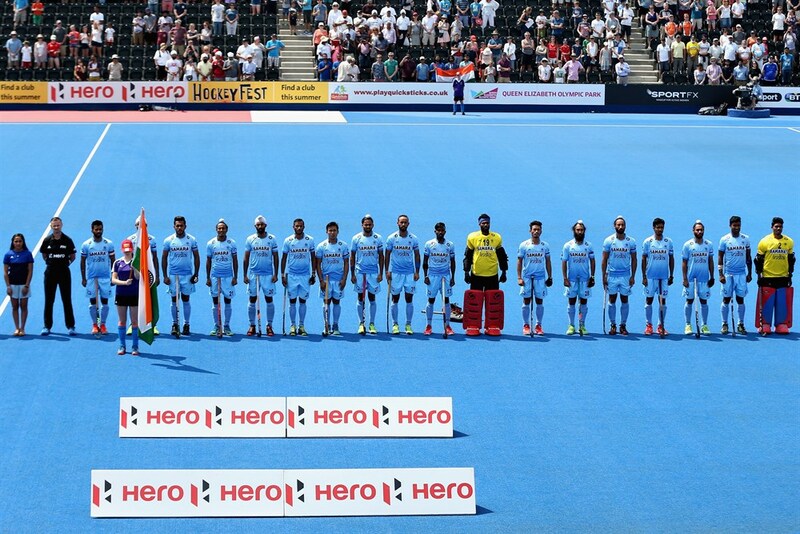 India were leading 3-0 at half-time and added four more goals in the second half to win the match. Pakistan could manage to score only one consolation goal. The 7-1 win is India’s biggest win over Pakistan ever. Earlier, India had beaten Pakistan 7-4 on two occasion, first in Champions Trophy in 2003 and then at Commonwealth Games 2010. 18th June 2017 @ 08.50 pm.